The RPA Museum Collection was commenced in 1933 by Miss Muriel Knox Doherty (the first Tutor Sister of the Preliminary Training School) with two books by Florence Nightingale, donated to the nursing staff by Sir Alfred Roberts, one of the founders of Prince Alfred Hospital. Anthony Hordern Department store donated a cabinet to hold the growing collection in 1936, which was cared for in the Nurses' Library by the Tutor Sisters until 1960. The Chairman of the Board, Sir Herbert Schlink made a room available in the Queen Mary Nurses' Home in 1960 and a committee of the newly formed Graduate Nurses' Association accepted responsibility for the care of the Collection, now known as the Museum of Nursing. One of the first curators, Miss Dorothy Armstrong, used the archival material and photographs to write a history of nursing, 'The First Fifty Years'. Major Hospital renovations in 2004 saw the Museum, now amalgamated with the Hospital Archives, re-located to the historic Operating Theatres on level 8 of the heritage-listed King George V Building. 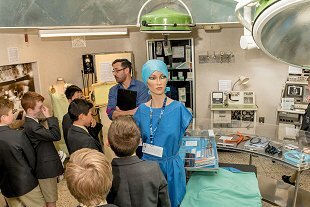 The new 'RPA MUSEUM AND ARCHIVES' reflect the change in funding support and the direction of the Museum, representing the history of the Hospital as a whole while maintaining a strong interest in nursing history. The Museum has been run by volunteers of the RPA Graduate Nurses Association until 2007, when the hospital appointed a professional historian. The Museum assisted in the preparation of the hospital history, 125 Year Anniversary Pictorial History, published in 2007 and are currently cataloguing the entire collection electronically. Two of our curators have written about the history of nursing at RPA. Dorothy Mary Armstrong published The First Fifty Years: A History of Nursing at the Royal Prince Alfred Hospital, Sydney from 1882 to 1932 in 1965 and Helen Croll Wilson completed this work with The Second Fifty Years: A History of Nursing at Royal Prince Alfred Hospital, 1932 to 1982, published in 2000. Both these books are available for sale.